My guest for this episode is David Bray, named one of the 24 Americans Changing the World under 40 by Business Insider. 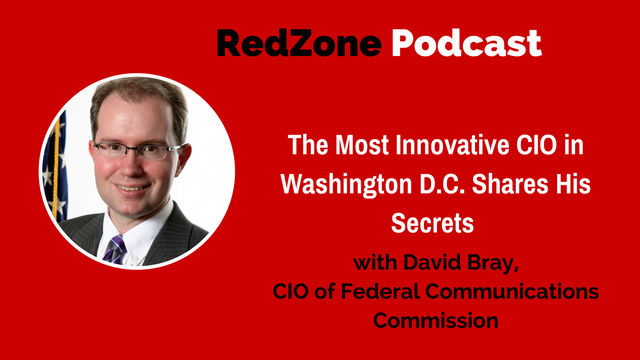 Dr. David A. Bray, who I believe to be the most innovative CIO in Washington, shares his secrets in this episode. He has been leading the FCC’s IT transformation since 2013 through the efforts of a team of positive “change agents.” He has transformed the FCC’s IT legacy from more than 207 different systems to award-winning technology in less than two years. He also was selected to be one of the “Fedscoop 50” for Leadership in 2014. FCW’s “Fed 100” winners in 2015, and the recipient of the Armed Forces Communications and Electronic Association’s Outstanding Achievement Award for Civilian Government in 2015. This entry was posted in Blog, podcast and tagged Bill Murphy, Change Agents, CIO, David Bray, exponential technology, FCC, Federal Communications Comission, innovation, Public Service, Redzone Podcast on October 28, 2016 by Bill Murphy.